Mish's Global Economic Trend Analysis: Oil Collapses to Six-Year Low, Brent Crude Hits Parity with West Texas Intermediate; Keystone Connection? Oil Collapses to Six-Year Low, Brent Crude Hits Parity with West Texas Intermediate; Keystone Connection? 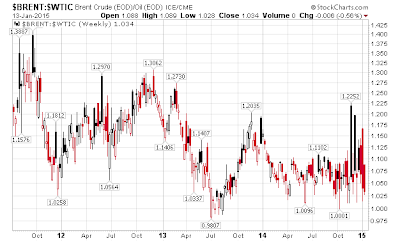 In late 2011, Brent traded with a huge 40% premium to West Texas Intermediate (WTI). 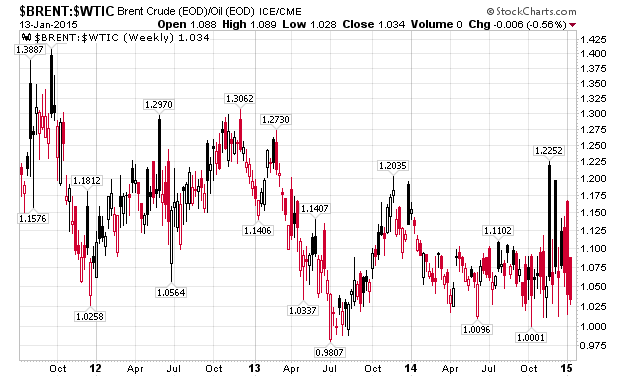 The spread collapsed to parity in July of 2013, but surged to a 22.5% premium late last year. The spread went negative again today, but a late day rally in Brent vs. WTI saved the day for Brent as the following chart shows. 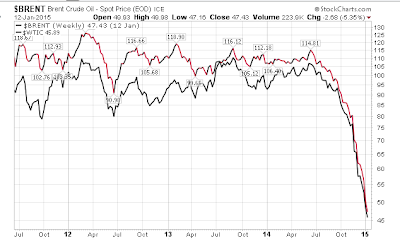 The Financial Times spoke of Betting on the Return of WTI-Brent Parity back on October 20, 2011. The reason given at the time seems rather amusing today - expectation the Keystone pipeline would be completed. The price difference between West Texas Intermediate and Brent crude reached a record high of more than $28 a barrel earlier this month. But, almost unnoticed, the market has started to price a return to the parity between the two benchmarks in five years. The bet on a return to WTI-Brent parity appears based on progress to build several new pipelines that promise to de-bottleneck Cushing, the key delivery point for the WTI benchmark, and the return of Libyan crude. Even taking into account the potential for delays, most traders believe that in five years, TransCanada’s 700,000 b/d “Keystone XL” pipeline would be in operation. Indeed, the company says it could be moving oil by late 2013 or early 2014. The US State Department gave a provisional green light to the $7bn project, although final approval is several months away. But the price difference between WTI and Brent is also coming under pressure for contracts for delivery in 2012 and 2013, suggesting that traders are not only betting on pipelines. The return of Libya to its pre-ward output level of 1.6m b/d, expected by late next year, would play a large role on the five-year forward spread, putting pressure on Brent prices. Some pieces of the Keystone Pipeline Project are completed, but President Obama has sat on others. 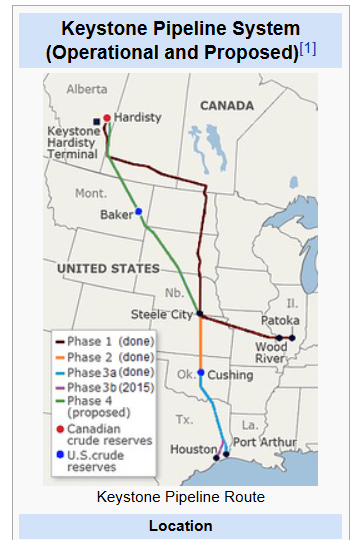 The Keystone Pipeline (Phase I), delivering oil from Hardisty, Alberta 3,456-kilometre (2,147 mi) to the junction at Steele City, Nebraska and on to Wood River Refinery in Roxana, Illinois and Patoka Oil Terminal Hub (tank farm) north of Patoka, Illinois, completed in June 2010. The Keystone-Cushing extension (Phase II), running 480-kilometre (300 mi) from Steele City to storage and distribution facilities (tank farm) at Cushing, Oklahoma, completed in February 2011. The Gulf Coast Extension (Phase III), running 784-kilometre (487 mi) from Cushing to refineries at Port Arthur, Texas was completed in January 2014, and a lateral pipeline to refineries at Houston, Texas and a terminal will be completed in mid-2015. The first two phases have the capacity to deliver up to 590,000 barrels per day of oil into the Mid-West refineries. Phase III has capacity to deliver up to 700,000 barrels per day to the Texas refineries. By comparison, U.S. oil production was about 9,000,000 barrels per day in early November, 2014; and in the preceding twelve months through August 2014, the US imported an average of about 7.5 million barrels of oil per day. The Keystone XL proposal faces criticism from environmentalists and a minority of the members of the United States Congress. In January 2012, President Barack Obama rejected the application amid protests about the pipeline's impact on Nebraska's environmentally sensitive Sand Hills region. TransCanada Corporation changed the original proposed route of Keystone XL to minimize "disturbance of land, water resources and special areas"; the new route was approved by Nebraska Governor Dave Heineman in January 2013. On April 18, 2014 the Obama administration announced that the review of the controversial Keystone XL oil pipeline has been extended indefinitely, pending the result of a legal challenge to a Nebraska pipeline siting law that could change the route. Yesterday the Huffington Post reported Senate Advances Bill To Approve Keystone Pipeline Despite Obama's Veto Threat. The Senate advanced legislation Monday night to approve the Keystone XL pipeline, even though President Barack Obama has already said he would veto it. Despite the strong vote, the Senate lacks the two-thirds majority vote needed to overcome a veto. The House passed the bill last week by a vote of 266 to 153 -- also shy of the 290 votes needed to clear a veto. Congressional action on Keystone comes after the Nebraska Supreme Court cleared the way last week for the proposed pipeline's route through the state. The Obama administration had been waiting for the Nebraska ruling to render its own decision on the pipeline, which is still forthcoming. 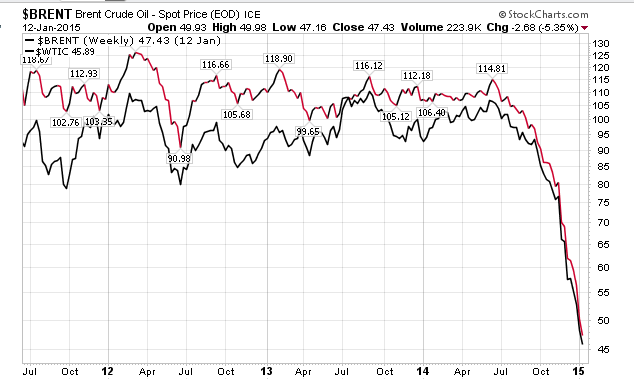 The primary reason many gave for the price discrepancy between Brent and WTI was the Keystone pipeline. That's a questionable proposition given pipeline capacity of 700,000 barrels per day vs. US production of about 9 million barrels per day in early November, 2014 with the US still importing an average of about 7.5 million barrels per day. The House voted 9 times in 2014 for the XL project, but every time passage was held up in the Senate. Obama put XL on hold pending a review by the Nebraska Supreme Court. Now that the Nebraska Supreme Court OK'd Keystone, President Obama issued a Formal Position saying he "strongly" opposes the bill. Thus, Obama's true position all along comes to the forefront: He never wanted to approve XL in the first place. Instead he hoped that Nebraska would kill XL for him. Now, forced to take a position, Obama promises to veto the bill. Since 2012-02-25, the price of crude is down from $128.40 to $46.81. That's a decline of 63.5%! Whatever fundamental or speculative reason there once was for the sometimes huge price discrepancy between Brent and WTI is now gone. What remains is oversupply coupled with solid evidence of a hugely slowing global economy led by Asia and Europe. The US will soon follow. For further analysis of the supply-demand setup, please see What's Behind the Plunge in Oil? Winners and Losers? Boon to Spending or Recessionary?